Adventure games have been dead for a long time. First-person shooters killed them in the PC gaming market, then took their place as the dominant touchstone of PC gaming culture. That's why no one expected an adventure game like The Walking Dead, a point-and-click adventure from Telltale Games that requires only a handful of hours to finish and requires players to shoot nothing beyond a handful of zombies, to win critical praise from nearly every media outlet in the business. It even won Game of the Year during the 2012 Spike Video Game Awards, beating out big-budget titles like Call of Duty: Black Ops 2. Clearly, adventure games are far from dead; instead, this classic genre that defined early PC gaming is finding a second wind and a new audience hungry for a story-driven experience. It's a good time to look back and remember why adventure games failed in the first place, then talk to some experienced PC game designers about what's next for the genre in the wake of The Walking Dead's surprising success. To find out where you’re going, sometimes you need to look back and remember where you came from. Adventure gaming traces its humble text-based beginnings back to Adventure (also known as Colossal Cave Adventure), a game based on the exploration of Mammoth Cave in Kentucky. Colossal Cave Adventure, the original adventure game. Rough computer-generated graphics were later added to Adventure and other games, but it wouldn’t be until the release of Enchanted Scepters on the Apple II that we got our first true point-and-click graphical adventure. From there, the PC gaming market exploded with adventure games; most of us can probably remember playing King’s Quest and Gabriel Knight from Sierra or the Day of the Tentacle and The Secret of Monkey Island games from LucasArts. These games afforded storytellers a means of overcoming the graphical shortcomings of early computers, since a great story can flesh out an imaginary world far better than an IBM 8514 video card. The Secret of Monkey Island, released for Mac and MS-DOS in 1990, was a landmark achievement in PC gaming. It was a golden age of adventure gaming that began in the mid-1980s and lasted almost a decade, until games such as Wolfenstein 3D, Doom, and other first-person shooters started to overtake the PC gaming market. They promised gorgeous graphics and quick, satisfying gameplay while most adventure games kept tantalizing players with puzzles that got more elaborate and ridiculous with each new game. As you might expect, PC gamers started embracing first-person shooters in droves while adventure game sales declined. Game developers followed the money; by 2001 there were no noteworthy adventure games in development, and it seemed like the genre was six feet under. But in the last few years a new breed of adventure game evolved across PCs, home consoles and tablets, bringing a fresh take on the genre that's attracting a fresh audience. Companies such as Wadjet Eye Games, Phoenix Online Studios, and Telltale Games look to bring back adventure gaming to its former glory by using new technological tricks and telling some heartfelt stories most games can’t touch. To understand why, I contacted some of the leading voices in adventure gaming to understand what's driving adventure gaming today. Everyone had different opinions, but one thing all agreed on was that adventure games can tell powerful, affecting stories with strong characters, and it's that strength which draws in new fans. Cesar Bittar, CEO of Phoenix Online, brings up how the design of the adventure genre allows for flexibility in storytelling. One of the main critiques of the adventure genre, however, lies behind one of its oldest mechanics, the “lock and key” puzzle. These puzzles can halt the flow of a game if the player gets stuck on a problem, but as Jane Jensen (the brilliant mind behind classics such as the Gabriel Knight series and the new Cognition: An Erica Reed Thriller) points out, many other genres of games use similar puzzles since the challenge fits so easily within the narrative design of a computer game. 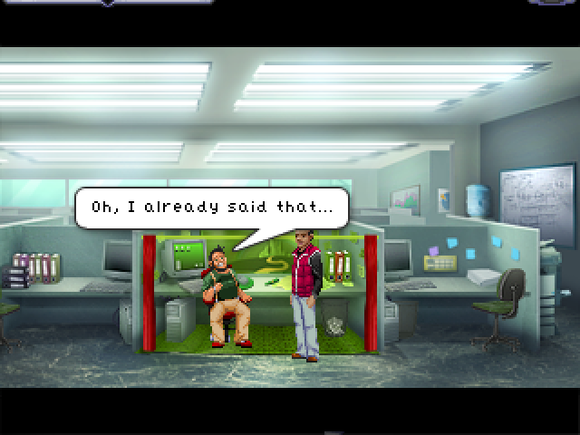 Resonance is a modern PC adventure game from Wadjet Eye Games. Dave Gilbert, the founder of Wadjet Eye Games, makes the strongest argument for keeping the tradition going: it’s what the player wants. Though the old ways still stand, all of the developers I corresponded with agreed that modern games are experiencing some real innovation, and they all pointed to one primary example: The Walking Dead. Dan Connors, cofounder and CEO of Telltale Games, says one of the biggest advances in The Walking Dead was how the developers used natural dialogue to make the game seem believable. Believable dialogue and characters made playing The Walking Dead a surprisingly emotional experience. But it's not just great writing that's bringing adventure games back; these games force players to make difficult decisions about how their games play out. Bittar notes that uneasy choices in adventure games “force you to make a really hard decision, and ramp up the emotional connection to the story in ways I have not experienced before." Meaningful choices put the player right into the story and allows them to interact with a fictional world in ways no other medium allows. Already, there’s a new world of adventure games coming from both smaller companies and veterans in the business that are looking to return to a more story-driven approach to gaming. If you aren't paying attention you'll miss the growth of a genre where new voices can rise to the top to reach out to an audience that’s probably never thought about picking up a controller. And with a wider audience, developers can start exploring different story genres such as romance, comedy, erotica, or even tackling bigger issues through the gaming landscape. It's happening right now, as a new generation tackles game storytelling on PC with free tools like the Twine game engine. More analogous to interactive fiction but not too far from early adventure games, Twine allows users to create their own text-based adventures that players can navigate via hyperlinks. Twine makes it easy to lay out and create your own simple adventure games. Available for both PC and Mac, Twine is simple and intuitive enough for anyone to use, and it allows anyone to develop a game that keeps track of choices the player makes as they move through your world. Only a year old, the free engine has already stoked the fires of inspiration by allows people to create stories ranging from your typical adventure to something far more personal. PC adventure games are back, and they have the power to be more powerful (and personal) than ever. When asked about the future of adventure games, most of the developers just wanted to see it continue to flourish, though how is anyone's guess: Gilbert advocates the need for adventure games to “move forward everywhere” while Bittar sees the advancement coming from technology, specifically virtual reality, where we can further immerse ourselves in the worlds they create. The most important thing to learn from the adventure game revival is that developers aren't taking it for granted; they're learning lessons from how adventure games died back in the '90s, and every developer I spoke to wants to prove that The Walking Dead isn’t some outlier of the genre, but the start of a greater adventure ahead.